I had a recent argument with a coworker (we are both engineers) that the amount of pollution generated by a person increases with the person's income (we both agreed on that)... but my coworker claimed that the fact that person lives in a big city or in a small town does not affect the amount of pollution, which I don't agree with. However I do agree that it is hard to estimate the average pollution generated by these two different lifestyles since in the in big cities people are more inclined to use public transportation, will have smaller residences which in turn will require less heating (we are in France, so assume Paris), but consume more disposable items and the foodstock have to be transported from more distant places. However people in big cities have higher income on average, thus they probably generate more pollution based on this, according to my coworker. But, for the same income, do both lifestyles, on average, generate the same amount of pollution or not? But both areas fall far far short of the exurbs, where people combine the negatives of both the city and the country for increased comfort and wealth. We can get a great look at the issue by looking at the US... particularly the CoolClimate Maps from UC-Berkeley. Hopefully it's all the data detail you're hoping for and more... with not just a map, but a breakdown of the different contributions for local transportation, housing, food, goods, and services needs. You can see that the pollution level within the three largest cities themselves (which account for over 1/4 of the state's population just within those three city limits) is actually quite low. Likewise though, the very distant rural areas -- large distances from the big cities -- tend to also avoid the darkest oranges and reds primarily. In addition, economics generally causes large bulks of resources to be moved in the most efficient way possible in urban areas, whereas often folks will travel many many miles for small objects that can be obtained more easily in cities. Plus resources like power and water require more pollution to transport over larger distances or generate locally than they do in the more streamlined bigger cities. 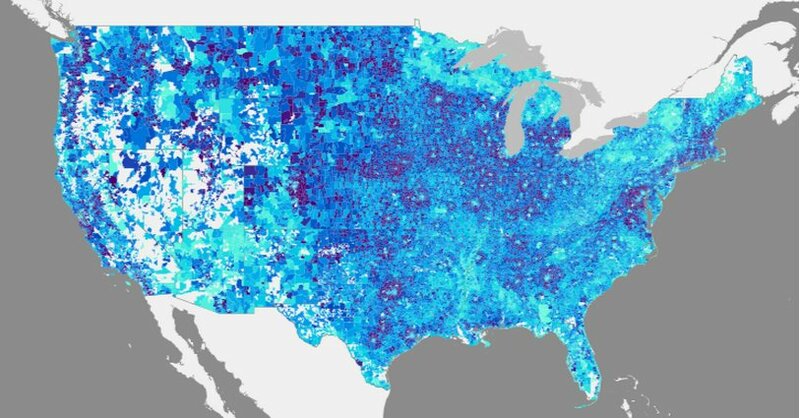 In rural areas, there is some important variability in these maps. I believe a lot of it comes back to a very central choice made in the calculation methodology: what part of rural pollution for travel and goods should actually be attributed to the urban areas? 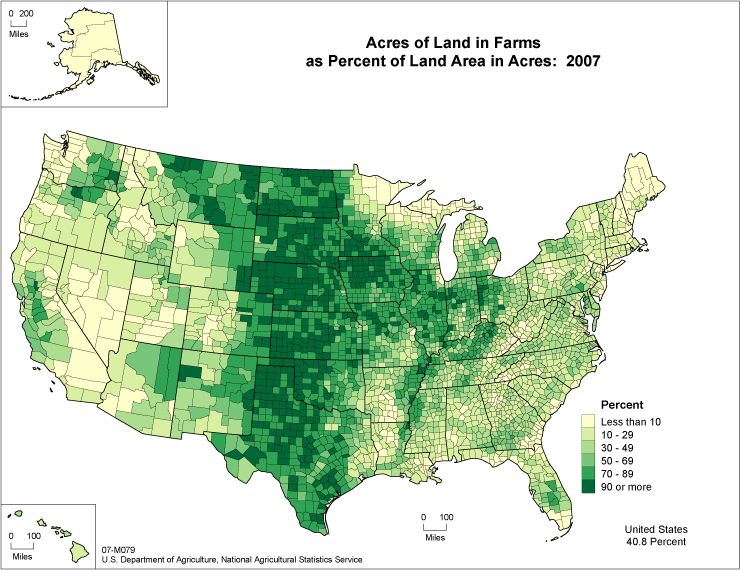 What causes the agricultural areas to show higher pollution? Probably because they must run significant machinery through the year, and have greater transportation requirements to get in supplies and then deliver their harvest. So the question then goes to: how much are the resource these agricultural areas using properly being broken down between the rural producers and the urban consumers? In the end, I know not. But it's certainly worth considering. In the end, it might just as well be fair to consider the agricultural resource needs to be more of a sunk cost, as someone must produce the food regardless... and to henceforth instead spread it around equally to all consumers rather than laying it to the fault of the agricultural regions. On the left is the pollution image. On the right is the loosely matched up city limits of all the larger-sized suburbs around the Atlanta area. And the result again is that not only is downtown Atlanta (the star) not too bad... but even many of the nearby suburbs aren't too bad. However, near/beyond the black ring (which is about 25 miles), you hit the worst. Atlanta has a lot of sprawl. But I checked dozens of decent-sized cities all around the US, every one showed the same structure, with a greener inner-core, and then a redder area around the edge of the city. People in such distant suburbs go there seeking to take advantage of the best mashup of the economic benefits of a big city yet with the cheaper costs and rural feel of living nearer the county. Instead, they end up merging up the greater consumption and larger food import distances of the big city with the greater required travel distances for wants and needs plus decreased efficiency. And the combination ends up being the worst of both worlds, at least in terms of carbon dioxide production. If you truly want to hold everything else constant, the country-dweller will have far more travel (since everything is further apart.) It is my experience, however, that people don't move to the country and then commute one hour longer each day. They move there and work from home, for example, as I do. Most days I do not leave my house. About once a week I drive for an hour or two total for shopping or visiting. I also have two trips a month to the Big City for medical reasons, but I generally do those by public transit. So I will argue that the countryside self-selects for people who drive, and in general travel, less than the city-dwellers. Here in Canada, country people are more likely to heat, at least partially, with wood, which is quite a polluting thing to do. Generally we can't get gas, so oil and electric are the main options. I think electric is the least polluting here, because much of it is either hydro or nuclear. Your country may vary on that. Since city people can get gas, they are more likely to pollute from their heating, though I expect the use of wood is a bigger factor. I think I personally pollute far less than most people, and at least some of that is because of where I live. Things that are easy for me to do are hard for city people to do. (For example I can take stuff out to the compost whenever I want instead of waiting for the weekly city pickup, and I don't have to use plastic bags for my compostable waste, I just take it out to the pile.) I am not sure your theoretical question can be answered in general, but I would tend to the "less polluting" side of things. Much depends on the local hierarchy of settlement. Canada tends to have smaller numbers of larger cities. There are relatively few cities in the 50-100K class. At present I live on a farm. (I grow landscape trees) * It's 6 miles to the nearest village. This is where I pickup parcels, and sometimes milk. It's also where I can take my lawnmower to be fixed, and buy an oil filter for my tractor. It's 15 miles to the nearest hardware/lumber store. It's 50 miles to the nearest large city. Our gasoline bill is lower now than when we lived in the city. We make fewer trips and more of the mileage is at highway speed. We work hard to combine multiple errands into a single trip. Still we are putting about 20,000 miles a year on our vehicles. Our natural gas bill is about the same year round. We heat mostly with wood. NG heats hot water, and one bathroom. I have 15 acres that I manage as a woodlot. This is not possible in the city. We tend to almost all of our grocery shopping on one day a month. One of the big city chains gives 15% off on the first Tuesday of the month. We run two freezers, but they are outside on the porch, and don't run very often in winter. A side effect of this is that we eat proportionally more frozen veg than fresh veg. We own a lot of steel: Two cars, a pickup truck, one 3 ton tractor, 1 3/4 ton tractor, two trailers, a few tons of implements. In addition to the IC engines on the tractors, we have two riding lawnmowers, a push mower, an auger, a soil mixer, a generator. We have one set of friends in Nordegg, AB. For them Nordegg is their Warburg, Rocky Mountain House is 120 km away, is a town of about 5000. Another 120 km will get them to Red Deer which is about 80K people -- one of the few midsize towns. Or they can do 180 instead and get into Edmonton. If you live in the eastern part of the province, the small towns 500 to 2K are still fairly common, but you may drive for 2 hours to get to a town that has multiple grocery stores. We have other friends who run a B&B in Vancouver. They have 5 grocery stores within a 6 block radius. Prices tend to be about 40% higher than here, mostly due to much higher land prices. But they don't have to pay for vehicle usage to go grocery shopping. Because they have to carry or cart the grocs uphill, they tend to buy only enough for a few days. This is much more common in Europe. Overall I would say I have a much larger carbon footprint than my vancouver friends, but not as large as the more rural parts of the province. Not the answer you're looking for? Browse other questions tagged pollution city-living lifestyle or ask your own question.